The Islanders open the Brooklyn era tonight. Yet for me, Opening Night doesn't bring the same excitement it usually does. We all know it will never be the same again for the Isles. I'm not sure I will ever fully get over the Islanders moving out of Nassau Coliseum. I made this video over the last few weeks to have something to remember last season by. Nearly every photo/video was taken by either me or my dad. I think it captures the Coliseum in all it's glory. The old saying in sports is, "There's always next year." However, for me at least, next year doesn't have the same hope and promise that usually does. I have been very fortunate in my life. I haven't really had to deal with death close to me. But tonight, all of us in blue and orange mourn as one. Throughout my life, the New York Islanders at Nassau Coliseum have been one of the few constants. Whenever I wanted to watch them, with the exception of a couple lockouts, they were there. When a relative died in 2003, I was scheduled to go to a game with my dad a few days later. I went to that game with an aunt, it seemed like a normal thing to do. To cope. Now we mourn not just a loss, not just the end of a promising season, not even the end of an era, it's the end of a lifetime. No building, not even a renovated Coliseum, will ever be the same as what we are leaving. What other arena in professional sports is called a barn? What other arena has hosted four consecutive Stanley Cup Champion teams? The New York Islanders were the first team ever introduced into my life, and Nassau Coliseum became a home just 15 minutes away from home for me. It's been a tremendous journey, and one I would not change for anything. While now is the time to mourn, eventually that time will pass. The new message will be: No Sleep 'till Brooklyn. 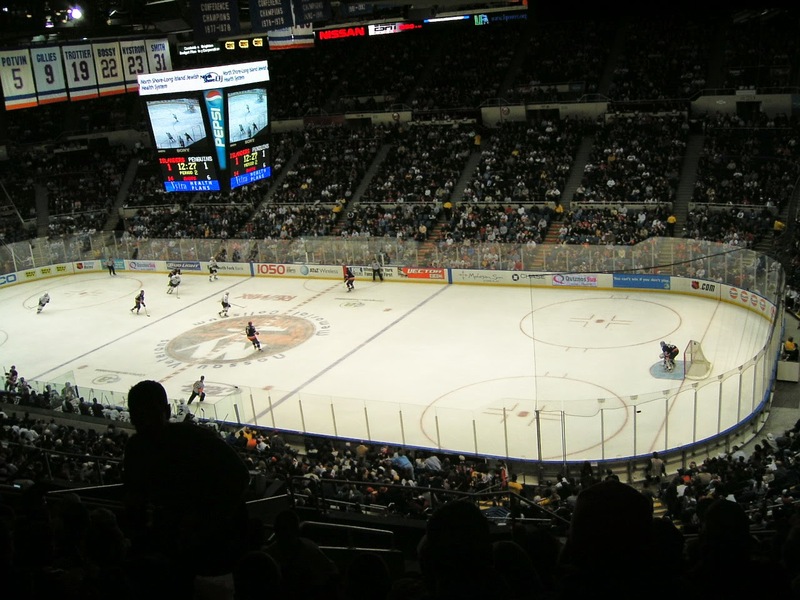 I went to my first New York Islanders game at Nassau Veterans Memorial Coliseum on Sunday, October 28, 2001. Now tomorrow, Sunday, April 19, 2015, I will go to what will very likely be my last Islanders game at Nassau Coliseum. In that time, I've went to roughly 50-75 games, I can't put an exact number on it. My first game was a memorable one, click HERE to read more on that. But it has been a journey that has taught me many life lessons. 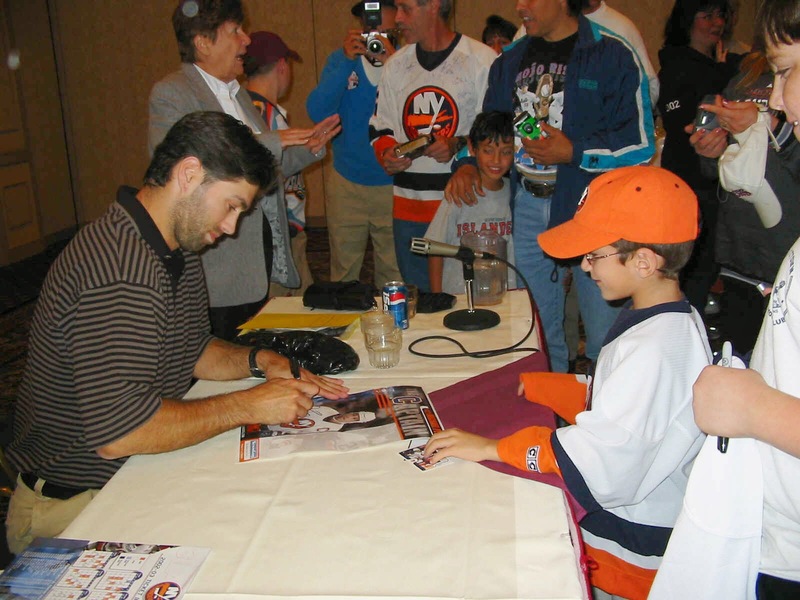 When I first became an Islanders fan, I had joined the New York Islanders Booster Club. During that time, I learned about the Islanders and their storied past. I met legends such as Bob Nystrom, Clark Gillies, and Pat LaFontaine. 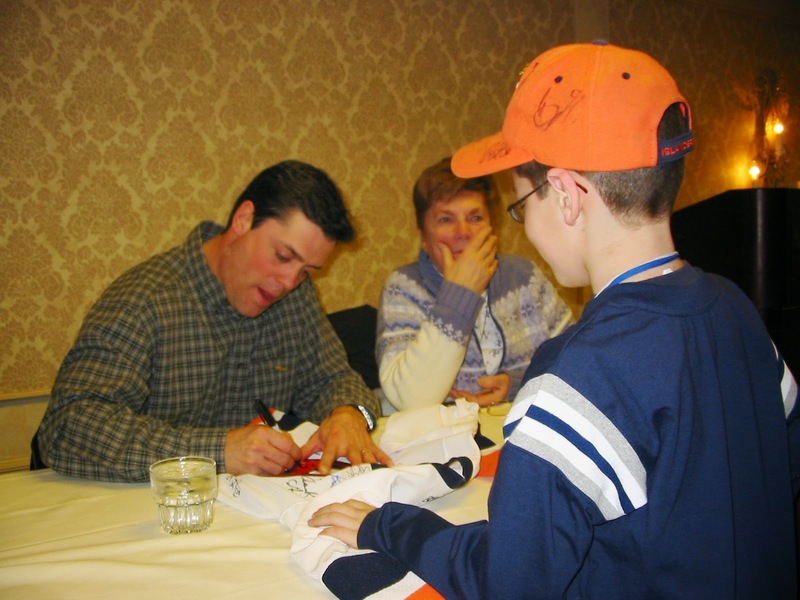 I also met then current Islanders such as Mike Peca, Dave Scatchard and Mariusz Czerkawski, among others. I got my first autographs, asked questions, and came to learn that my favorite team was in my backyard. I was a member of the NYIBC until I was in middle school. However, the Booster Club was only a part of my growing up. I went to games all the time, usually with my dad. There were stick days, hat days, mascot days, and many other promotions. Shortly after my first game, I had a hat, shirts, jersey, you name it. To this day, I have stack of books in my basement that has every Islanders yearbook since the 2001-02 season, with programs and media guides from all those years scattered in there. I learned the old-fashioned goal song, which I think should still be the goal song, but times change I guess. My whole life, I was known as "The Islanders Fan." For a young kid, I'm guessing I had a very good understanding of what was happening on the ice compared to many other people. Early in my life, being an Islanders fan was pretty cool. We had Shawn Bates' penalty shot in 2002, which I remember watching in my bedroom with my father. The Islanders made the playoffs three years in a row when I began following the team. Two of these years, my father had purchased tickets to game six of the first round of the playoffs. Both years, the Islanders were eliminated in five games, so my dreams of going to a playoff game needed to wait. But for me and most Islanders fans, going to the game meant going to watch a game. Nassau Coliseum has a far too small concourse, not so good food, a scoreboard that isn't big, and not too much fanfare. But what it lacks in amenities it makes up for in views of the game. In every seat in Nassau Coliseum, you can see the full ice surface, and you are usually able to hear hear the game pretty well. Here's a good example of that. One photo below was taken sometime between 2002 and 2004, sometime before the full season NHL lockout in 2004-05. One photo was taken in January 2015. Both are from the upper 300 level of the Coliseum. What changed? Pretty much nothing except the camera that took the photo of the spectacular view. Now, I'm not saying that Nassau Coliseum isn't an outdated facility. It is. Compared to newer arenas, it could be considered a minor league facility. When you walk up the stairs at the 300 level at the Coliseum, your feet stick to the floor and unstick with each step, something you would more likely see at a bar than an NHL arena . That's probably the result of 43 years of beer and soda spilling all over them, but it's one of the small things that make the Coliseum great. The roof at Nassau Coliseum isn't that high. The arena is built specifically for hockey, so the noise goes straight down on the ice, it doesn't leave. When you look up at the ceiling, you see dozens of banners commemorating the Islanders glory years of the 1980s. Four Stanley Cup Championship banners await company while others in blue and orange symbolize the Islanders 19 consecutive playoff series wins, a record that I doubt will ever be broken. But for now, back to my journey. The NHL lockout of 2004-05 hurt. I was only 11 years old at the time, and all that free time let me start watching football. With the exception of Wade Dubielewicz poke check in 2007 that sent the Isles to the playoffs, the Islanders were just terrible from the moment I entered middle school. However, I was Al Arbour's 1500th game coached in 2007, and that moment was the first time I've ever seen a banner get raised to the rafters. It was a brief moment of glory in an otherwise forgettable time to be an Islanders fan. Eventually, I started going to games by myself and with friends, not necessarily with my parents like I used to. In 2009, the wheels fell off the train. The Islanders finished with 61 points, by far worst in the NHL. I learned how to deal with losing, there is always tomorrow. Tickets for games were cheap and I went often with a friend who had season tickets. I had fun at those games, getting a bunch of cool autographs and other pieces of memorabilia. I remember seeing Sean Bergenheim score a hat trick with 0.7 seconds left in the game, which was probably the best moment I'd seen in person to that point. But then, things stared to change. John Tavares was drafted. I was at his NHL debut. I remember screaming 'John Ta-va-res' after his first NHL goal. For seemingly every season, I was at opening night. The one night of the season when everyone starts the same. In my head, the Islanders just weren't was good of a team, but they were MY team. They weren't New York's team, they weren't Long Island's team, they were MY team. Yet, all through my high school years, they continually let me down, time after time after time. One night in 2011, right after the Islanders made Jack Capuano head coach, my frustration with losing reached a high point. 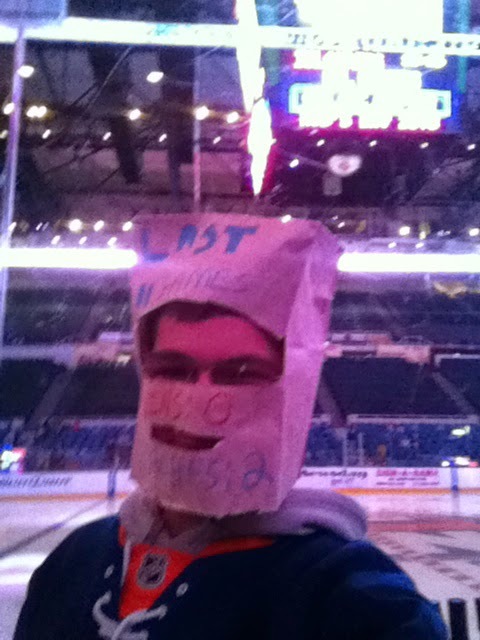 I wore a bag on my head to one of the games that season. It said "Last 11 games: Wins: 0 Coaches: 2." The team lost consistently, and I learned how to deal with it. During the 2010-11 season, I went to 14 games, the most I've ever been to in an Islanders season. That day, Sparky jokingly ate my head. People asked to take photos with me and of me, and I figured out that being last place can be fun. However, being the lovable loser gets quite old after a while. Enter the lockout of 2012-13. I spent countless hours watching TV and looking at Twitter to see how the negotiations were going. It wasn't fun. That was my first semester in college, and the Islanders weren't there. But, I think they were just waiting for me to come home. I'd been to pretty much every home opener since 2005, and I couldn't make the original 2012 one due to school. During the lockout, it was announced the Islanders were moving to Brooklyn, but that seemed like an afterthought at at the time. However, the lockout finally ended in January 2013 and I was home to go to game one of the shortened 48 game season. Heck, I even went to the Coliseum at 9 a.m. on a Wednesday to watch training camp. The Islanders lost that home opener to the Devils, but there was no better feeling than watching the Islanders back where they belonged. That season was magical, as the Islanders made the playoffs for the first time since I was in middle school. That series against Pittsburgh in 2013 was an amazing one although I couldn't get to one of the games. Just the thought that the Islanders were once again a legitimate NHL team competing in the Stanley Cup Playoffs was a new one in my head. In 2013-14, I got to go to a few games over Thanksgiving and other school breaks. I also got lucky and videotaped some memorable Islanders moments such as Ryan Strome's First NHL Goal and John Tavares' Hat Trick Goal, both on the same night. Although the season wasn't good, it was something to build on for this season and I got some cool memorabilia out of it, my favorite of which you can see on the right. But finally came this current season, the final on at Nassau Veterans Memorial Coliseum. It started off with the Draft Party and Rookie Scrimmage, and at those events I could tell this was going to be a fun season. I got to go to the Islanders preseason game in Brooklyn in September. Don't get me wrong, Barclays Center is a state of the art facility and the Islanders will be happy to call it home. It has great food, huge concourses, a giant video board, and is the type of 21st Century Arena the Islanders haven't had. But the arena isn't quite a hockey arena yet. The sight lines are off, and it just didn't feel like home to me. But ready or not, Brooklyn we come. I've seen other great moments at the Coliseum this season, but it's not over yet. Like many other Long Islanders, I have grown up going to the Nassau Veterans Memorial Coliseum. 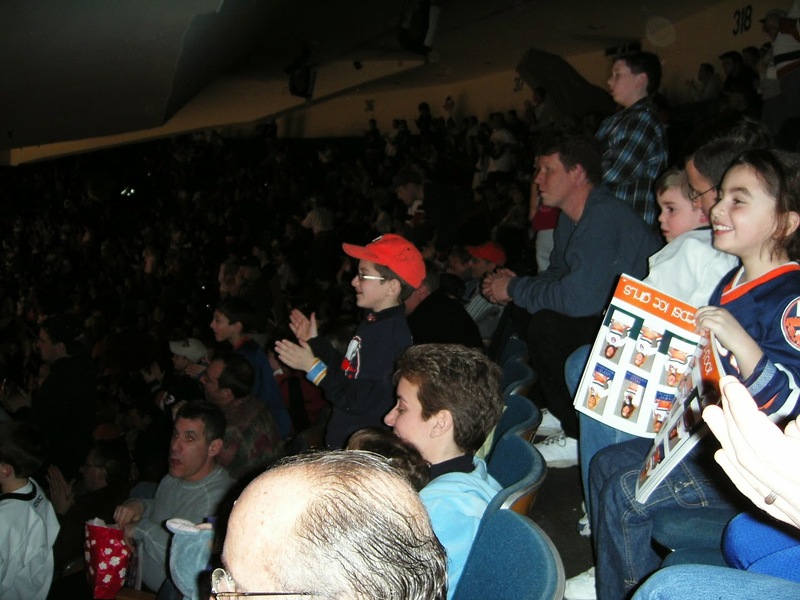 At my first game at Nassau Coliseum, I was a seven years old and in second grade. At what may be my last, I am 20 years old and a junior in college. Today, I'm going to a Stanley Cup Playoffs game at Nassau Veterans Memorial Coliseum. We have nearly reached the end of our time at Nassau Coliseum. As the end gets closer, I will be posting my photos of some of my favorite times at the Coliseum and relating to my life as an Islanders fan. This team has been a big part of me growing up, and now I feel like it is going to be taken away from me. When I was younger, I was a member of the New York Islanders Booster Club. They had meetings with players a few times over the course of the season. This is the first player I've ever met and the first autograph I've ever gotten, former Islanders captain Mike Peca. Both the hat and jersey I am wearing in that photo are now adorned with signatures from Islanders legends and hang in my bedroom. This was just the beginning of my lifelong love for the Islanders. Hopefully we won't be without this for too long.